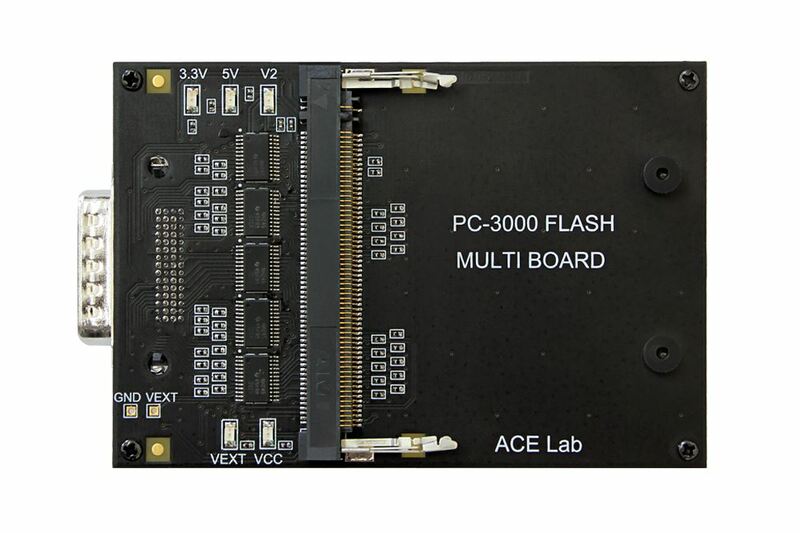 The PC-3000 Flash is based on our own "know-how" technology of getting direct access to Flash memory microchips. 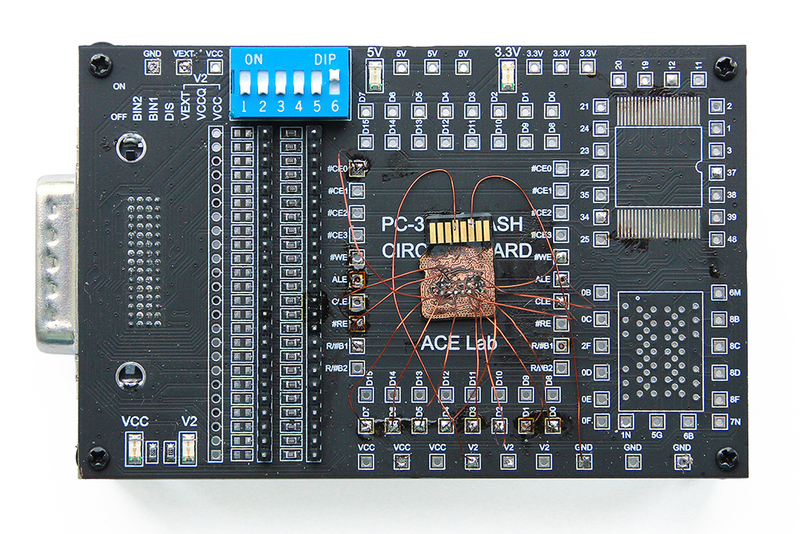 The microchip is desoldered from the storage device and read by our special device – the "Flash reader" – providing access to data when the controller is damaged. 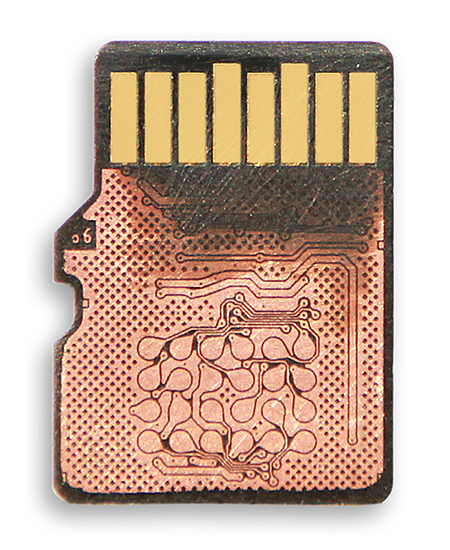 This technology greatly increases the chances of successful data recovery even when the storage device is physically damaged. 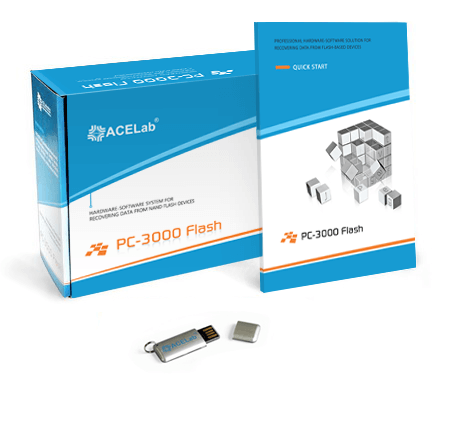 With the PC-3000 Flash, you can recover data with "one-click" using the PC-3000 Flash Global Solution Centre. It is a dream come true for data recovery specialists! PC Flash Reader - 1 pc. TSOP-48 Adapter – 1 pc. LGA/TLGA-52/60 adapter (14x18) - 1pc. 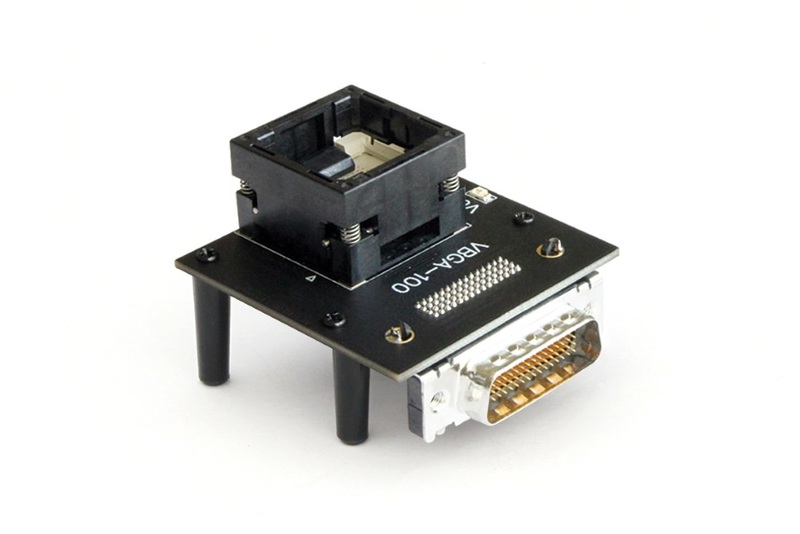 BGA-152 adapter - 1 pc. 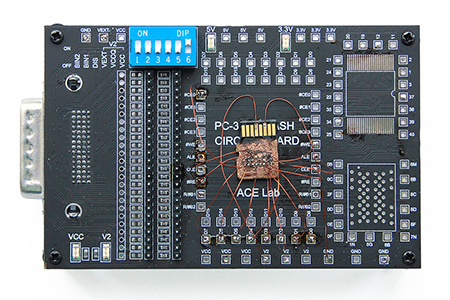 Circuit Board adapter - 1 pc. 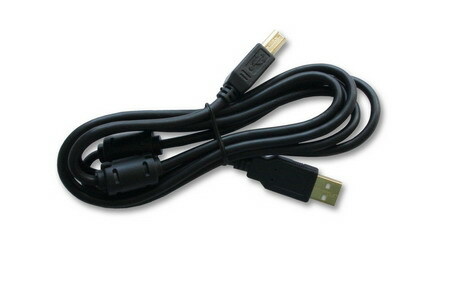 USB 2.0 Defender Cable - 1 pc. 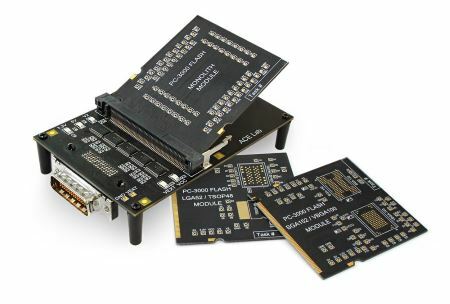 In a contemporary NAND-based flash drive we can roughly single out the following parts: interface, controller, memory chip, and internal drive firmware (microcode). The interface can be of any kind - SD, microSD, XD, USB 2.0 or USB 3.0 - and it is a linking unit between the controller and the 'outer world'. The controller processes the incoming data, makes some preparations, converts and mixes the data and prepares it for writing into the memory chip (backwards conversion will take place when the data is read). Memory chips store the received data (a drive may contain one or more than one memory chip). The drive's firmware operates the controller and the interface modes and it monitors the damaged memory cells of the microchips. The PC-3000 Flash System allows to diagnose a drive and to determine the essence of the problem. All malfunctions of solid-state drives can be divided into two groups: logical (all units of the device and the microchip are working properly and without fail, but a problem occurs with the damaged file system, with the accidentally deleted files, with the data loss after formatting, etc. ) and physical (damage to electronic components or to firmware, resulting in a drive failure). Power stabilizers, the controller microchip or the drive's firmware located in the controller (or in the service area of the memory chips) are the most frequent reasons of failure. To resolve each of these problems, the PC-3000 Flash uses a particular set of its own tools and methods enabling to identify the malfunction and to get access to user data. Physical malfunctions of drives occur quite frequently. One the possible causes of malfunctions is the low quality of the drive's electronic components. There can be many other causes, such as incorrect exploitation, etc. In such cases, the controller is the faulty component, whereas the user data remains intact and it is located in the non-volatile memory chips. However, in case of such malfunction, the data can't be read in the standard mode via the device's interface. 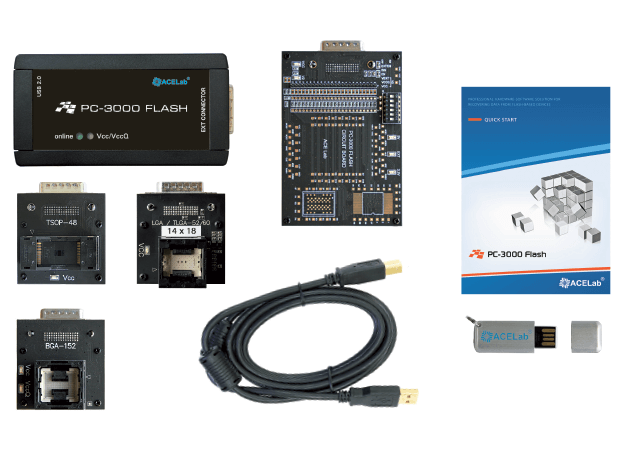 To resolve such problems, the PC-3000 Flash System uses a complex unit of software and hardware parts. 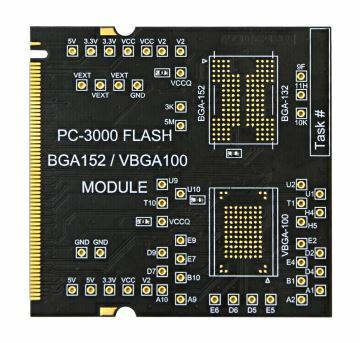 The System's hardware part makes it possible to read any NAND-memory chips (at first, memory microchip should be unsoldered out of the drive and inserted into the reader of PC-3000 Flash). As soon as a file containing the data from memory chips is obtained, you can further work directly with the data you have read. 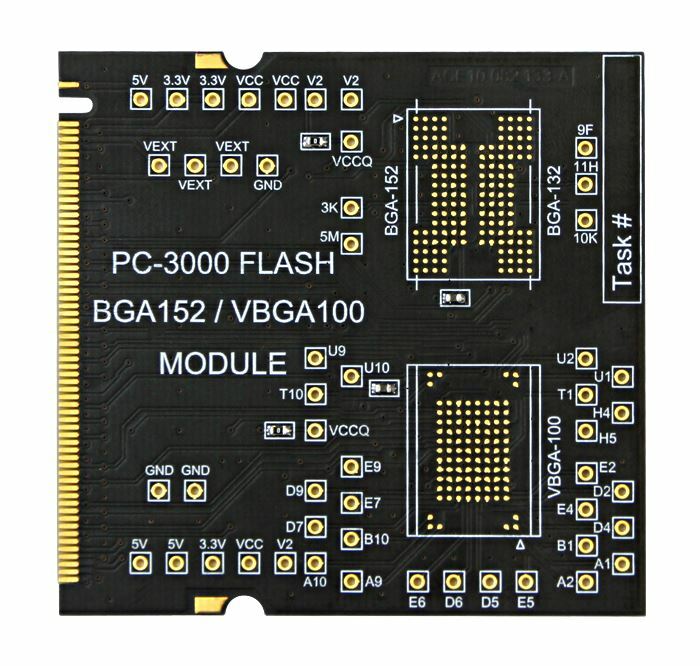 It is almost impossible to damage the data, and so it is absolutely safe to use the PC-3000 Flash System, as you can go back to the initial dump of each microchip at any time. At the next stage, a set of mathematical tools and methods is used which enables to emulate the operation algorithm of almost any drive controller. 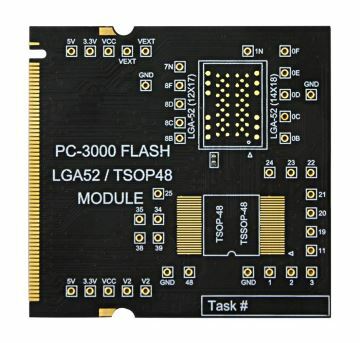 Hardware features: PC-Flash Reader 4.0 device. NEW! 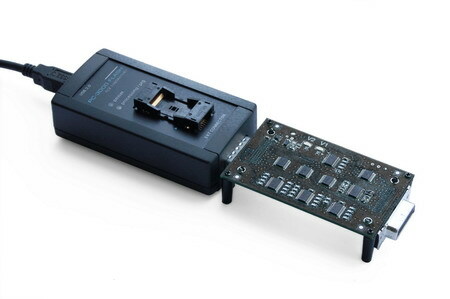 A large percentage of contemporary NAND-based flash drives is made up by monolith drives (System on Chip, or Embedded Solution), where the controller, the memory microchips and all the passive elements are placed inside one physical case. The only external port for this kind of flash drives is the interface port which it is intended for (USB, SD, MS, Micro SD, etc.). 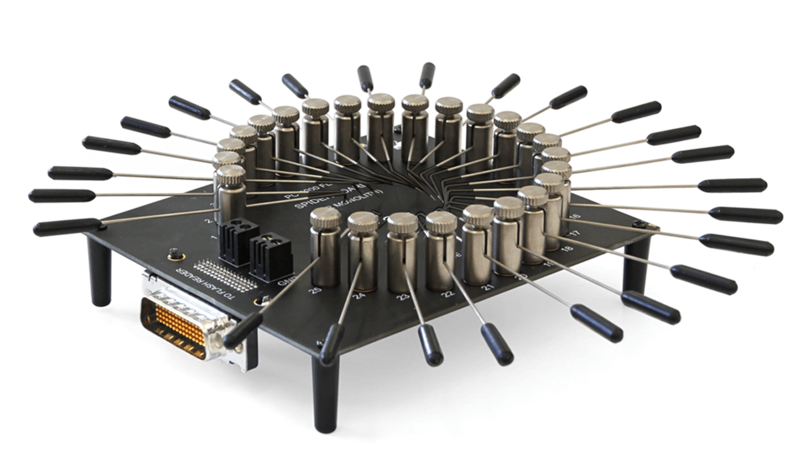 If this kind of device has a malfunction and if it is impossible to work through the standard interface, there is a way of getting access to the internal memory chips inside the monolith device, using soldering to special pinouts situated on the circuit board or by direct soldering to the traces of the circuit board. 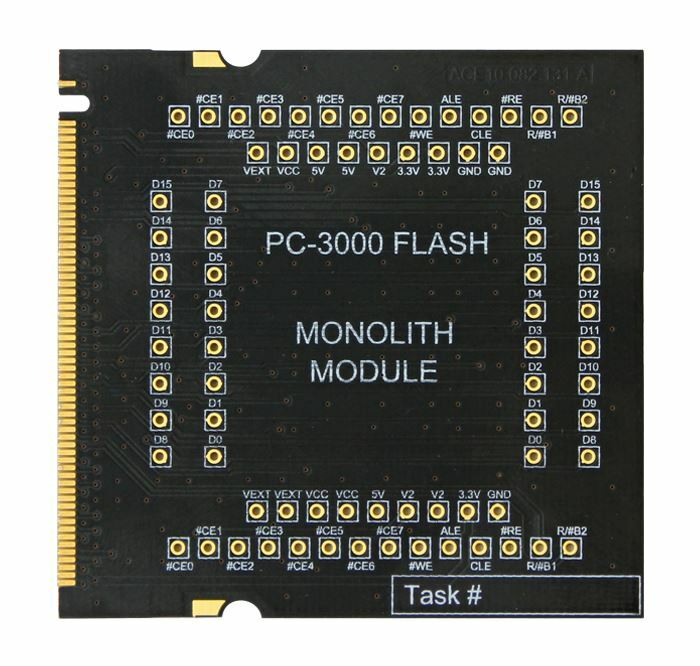 Specifically for such tasks, the PC-3000 Flash System has a Circuit Board adapter, designed to make it more convenient to connect the monolith to the PC-3000 Flash System reader. 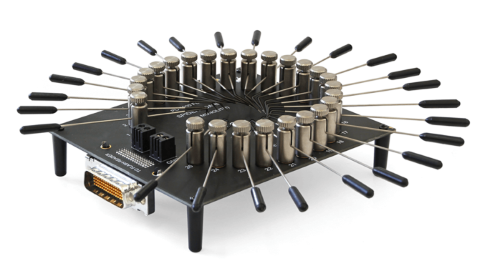 The monolith library is regularly updated and it contains information about the soldering pinouts for getting connected to the monoliths' memory chips. 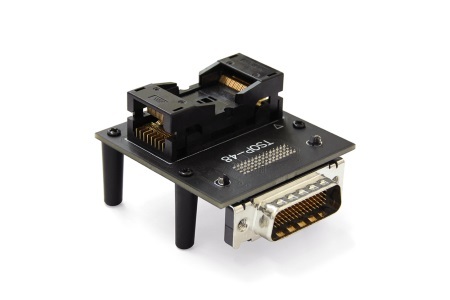 Adapters are based on the specialized ZIF panels, providing a convenient and secure method of installing memory chips. 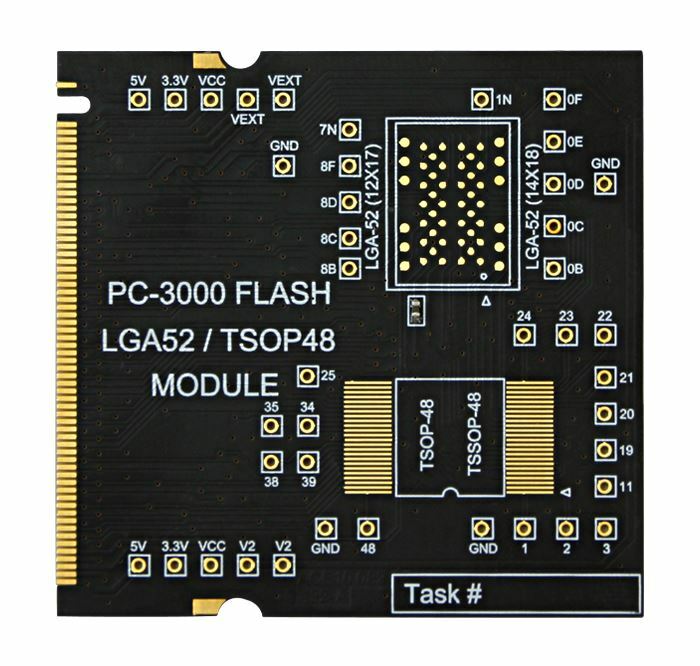 Adapters are fully compatible with the PC-Flash Reader version 3.0 and support the chips in LGA/TLGA-52/60 case. The difference is the width of the memory chip packages - 14x18 mm and 12x17 mm. It is possible to center manually a narrow chip (12x17 mm) inside the socket of LGA/TLGA-52/60 (14x18) adapter. The adapter has a power supply LED- indicating the voltage supplied to the memory chip. 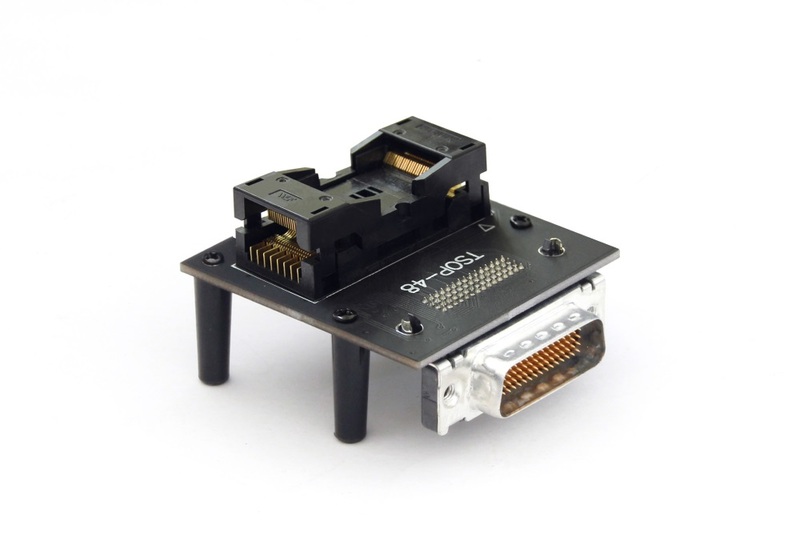 The adapter is based on the specialized ZIF panel, providing a convenient and secure method of installing memory chips. The adapter is fully compatible with the PC-Flash Reader ver. 3.0/ver.4.0 and supports the chips in VBGA-100 case. LED allows you to visually monitor the voltage supply submitted to the memory chip. 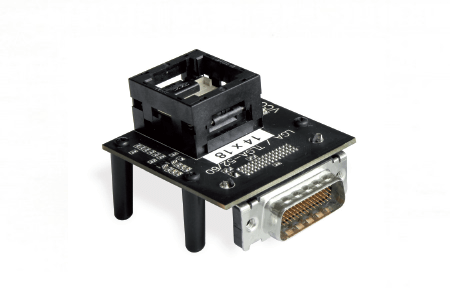 The adapter is based on the specialized ZIF panel, providing a convenient and secure method of installing memory chips. The adapter is fully compatible with the PC-Flash Reader ver. 3.0/ver.4.0 and supports the chips in TSOP-48 case. 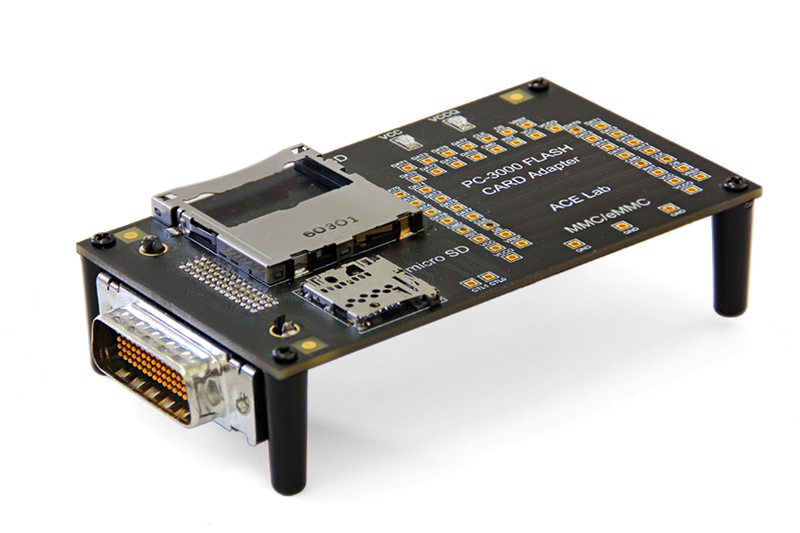 LED allows you to visually monitor the voltage supply submitted to the memory chip. While working with monoliths soldering is highly effective, it should be the last resort for a data recovery engineer. 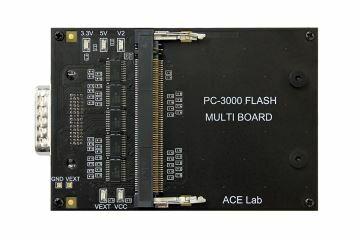 Before turning to this sophisticated process, safer and cheaper solutions should be used - like Card Adapter for PC-3000 Flash. 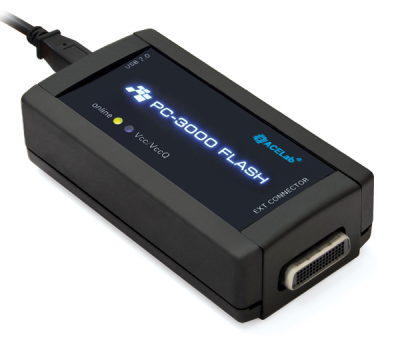 July 11, 2018 The new PC-3000 Flash software Ver. 7.2.5. is available! New "Intelligent ReRead mode", New algorithm of "ReadRetry mode checking", PC-3000 Resource manager (XOR, ECC, Page transformations, Chips ID, reading rules, ReadRetry types) and much more! On the top of that, most of the tasks are now performed in the background. New data preparation method of "XOR for page by page number"
New data preparation method of "Copying in analysis result"